Marketing professor Kusum Ailawadi studied how gasoline prices impact consumers’ grocery shopping behavior. For a few months now, the average price of regular gasoline in the United States has been near or above $4 per gallon, a level we haven’t seen since 2008. As we all know, demand for gasoline is relatively inelastic, so when prices at the pump go up, people have less money to spend on other things. The effect on budgets can be significant. Between 2003 and 2008, the amount that median-income households spent on gas rose from 4.6 percent of income to 11.5. In addition, wages have been stagnant for much of the middle class since 2000. Which leads to a big question: How have consumers changed their shopping patterns to deal with a steady decline in their disposable income? One way, says Kusum L. Ailawadi, the Charles Jordan 1911, TU’12 Professor of Marketing, is by being savvy at the grocery store. In a paper published in March in the Journal of Marketing, Ailawadi and three colleagues investigated the impact of gasoline prices on grocery shopping behavior, and found some surprising results. Their study looked at household-level shopping and spending of 1,389 panelists in a major metropolitan area between 2006 and 2008, tracking data across different stores, retail formats, and 297 product categories. Then they related that data to gasoline prices in the metropolitan area over the same time span, while controlling for other important drivers of spending like grocery prices, promotions, and the general state of the economy. The overall findings are quite intuitive. Given a 100 percent increase in gas prices (say, from $2 per gallon to $4), the consumers in the study showed a 20 percent decrease in their monthly shopping trips, a 14 percent decrease in monthly purchase volume, and a six percent decrease in monthly expenditures. The details are more interesting. The biggest losers during a time of high gas prices were conventional grocery stores; they lost market share to drug stores, mass format stores (such as Kmart, Walmart, and Target) and so-called “supercenters” (the mass format stores that also carry produce). Even though consumers visited drug and mass stores less frequently, they consolidated their shopping and spent more in these stores per visit. There was no significant change in the market share of warehouse club stores, such as Costco and BJ’s Wholesale Club. Other losers were regularly priced national brands and, surprisingly, the bottom-tier brands. What explains the slip in bottom-tier brands, Ailawadi says, is that promotions allowed top brands to retain their consumer franchise while the most price sensitive consumers, who were already buying lower tier national brands shifted to the even cheaper “private label” products now offered by most retailers. While regularly priced national brands suffered losses, customers responded well to national brands being promoted with discounts in the form of coupons and weekly promotions. For Ailawadi, this shows that consumers “aren’t fundamentally giving up what they like; they’re trying to find it in less expensive ways even if it means cherry picking promotions from different stores." The data from Ailawadi’s study came from a time of a relatively short but intense surge in gas prices. 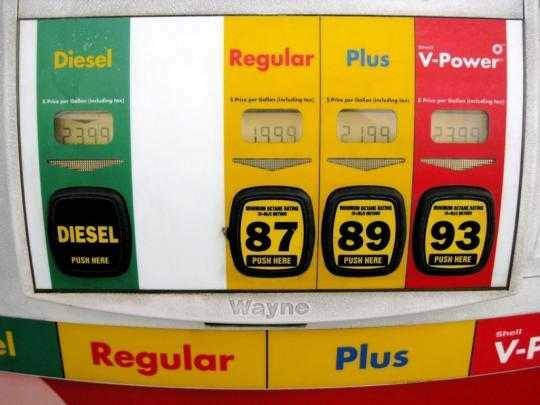 Today might be different: the U.S. Energy Information Administration forecasts that the annual average regular-grade retail gasoline price will increase from $2.78 per gallon in 2010 to $3.63 per gallon 2011 and to $3.66 per gallon in 2012. That raises another question: Will the patterns in Ailawadi’s study change once consumers recognize that high gas prices are here to stay? It’s hard to tell, but there are still lessons that retailers can learn from her research. The first word of advice: Don’t try to reduce cost and prices by cutting quality. “The consumer is going to be unhappy because you ruined the quality of the brands they trust,” Ailawadi says, “and you won’t be able to match private label prices anyway.” The second lesson is that even though higher gas prices will cut into a retailer’s margins, manufacturers and retailers should not cut their promotions to make up for it. Chances are, they’ll lose customers to competitors, and other research shows that many of them might not come back. “Manufacturers love to hate promotions, because they think it makes customers more price sensitive,” Ailawadi says. “And they love to love advertising, because they think it builds their brand equity.” The truth, she says, is that increasing advertising beyond its already high level doesn’t accomplish much, and cuts in promotions can really hurt because fewer consumers buy the product. Looking ahead, Ailawadi believes that retailers who balance attractive promotions on national brands with about a 30 to 40 percent rate of private label goods will be well positioned to grab the most customers. The ascendance of supercenters, interestingly, is not a fait accompli; they’re often a long drive from consumers’ homes, and as times get tough, people travel less. Grocery stores have a distinct advantage because of their convenient location, but Ailawadi cautions that they will have to be smart and aggressive with their promotions, especially by attracting buyers with cheap marquee goods, like milk and diapers, and hoping they’ll stay and shop for other things.